Activities for young and old right on the doorstep. Outdoor enthusiasts, both young and old, will find plenty to do both on the farm and nearby. Being set right in the centre of Wales we have the wild and remote Cambrian Mountains close by to the west and softer more gentle farmland to the east. Whether you are an avid hill walker seeking strenuous days out or a weekend cyclist looking for a day or two riding along pleasant and quiet lanes you will not be disappointed, and days out can be tailored to your own ability, starting right from the door. Equally many of the routes are also suitable for horse riders, whose mounts we are also able to accommodate. Canoeing on the River Wye is another popular pastime, as is fishing on the nearby lakes. 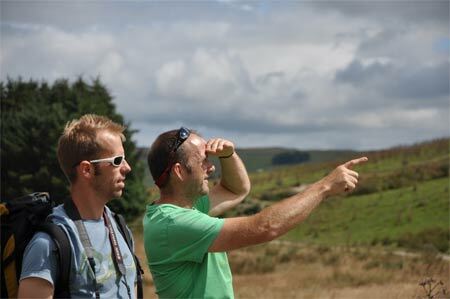 Alternatively time can be spent on the farm, with birdwatching a very popular pastime. Over 50 different species having been sighted, including Curlew, Lapwing, Skylark and Linnet to name just a few. 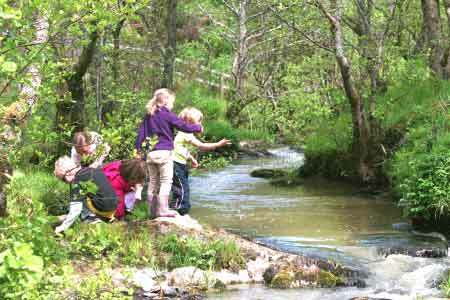 The river is a picture in summer with lovely pools for bathing, and it is also teeming with wildlife. The 'beach' is a wonderful corner where you can sit with a picnic, totally secluded, quiet and far removed from the troubles of the world. Below you will find just a few suggestions. This part of Wales has yet to be discovered, and the more time you spend here the more possibilities you will discover. Besides offering accommodation we also run a small farm with a diverse range of animals and birds. 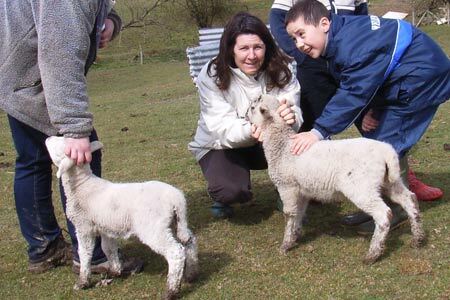 Children, and their parents are welcome to join us at feeding time to meet the animals and join in with the day to day farm activities. Depending on the time of year there may be baby chicks which need feeding, or young lambs to be bottle fed. Sadly, Tammy, the Tamworth pig, is no longer with us but we may get some more piglets in the future. The farm is managed with nature in mind and we have a wonderful grass meadow and river bank which has an extremely wide bio-diversity and is ideal for bug hunting forays and, of course field study visits. Likewise we have a huge selection of wild birds, many of which are classified as being of high conservation concern by the RSPB. Of course you may be arriving back after a hard days walking or cycling in the Cambrian Mountains, in which case you may prefer to head straight to the river to cool off and relax. There are numerous circular routes for walking, cycling and horse riding close by, apart from other possibilities such as Glyndwrs Way. Indeed the more time you spend here the more possibilities you will discover, and we are always happy to discuss ideas during your stay, or even before you arrive. To get you started here you will find just a few suggestions which we have explored and enjoyed ourselves. 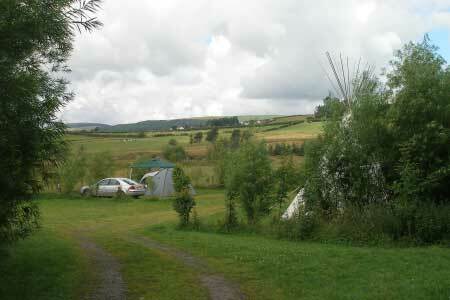 The Gilfach Nature Reserve is always a favourite at any time of the year or in any weather. We are pleased to be able to offer activity and skills courses in association with Learn Outdoors, a locally based company specialising in outdoor training, bushcraft, DofE expeditions and team building. Our friends at Cambrian Safaris offer excursions into the Cambrian mountains, in their Land Rover Discovery which is Licensed for Private Hire. Come and enjoy the fantastic views and scenery, local history and wildlife. They will pick you up from your accommodation or a meeting point and take you to places not normally discovered by visitors. Fishing is possible on some of the local lakes, such as Llyngwyn, and on the Rivers Wye and Severn. Permits are available from the newsagents in Rhayader. Further details can be found on the Rhayader Angling Association website. 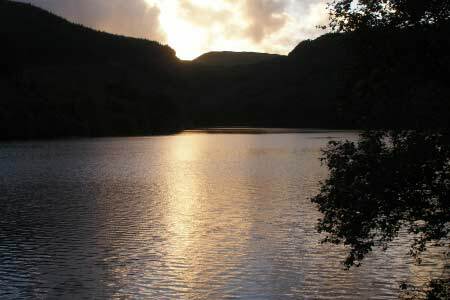 Canoeing is possible on the River Wye and also at Llyn Clwedog, north of Llanidloes. It may also be possible at other locations but we do not have any further information.